Inside the cover of this book I found two bookplates, one that read “The Brick Row Shop,” and another that was labeled with the name Harry Bacon Collamore. The Brick Row Shop is one of the oldest antiquarian book businesses in the United States, and specializes in first editions, rare books and manuscripts from the 17th through the 20th centuries. Indeed, it makes sense that a book such as the one that I found in the Watkinson Library was associated with a business that dealt with rare books. 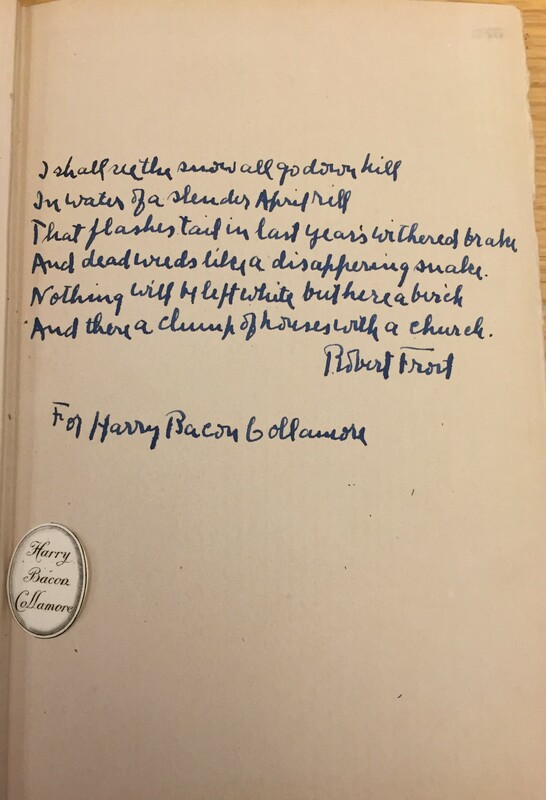 Harry Bacon Collamore’s bookplate, however, has some history behind it. 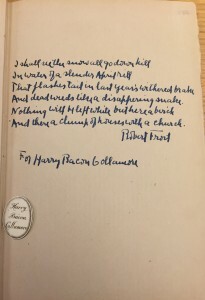 Harry Bacon Collamore donated many modern English and American first editions to the Watkinson Library, including major poetry collections of Robert Frost. He was the president of the Watkinson trustees as well as of the Trinity College Library associates. Although the relationship between Frost and Collamore is undocumented, the two clearly had a unique friendship. I can attest to this fact because out of the many Frost books that I looked at in the Watkinson, many of them were signed to Harry Bacon Collamore from Frost. The physical aesthetics of this edition of New Hampshire are quite striking in their simplicity. The book itself was in formidable shape as well, considering it has been around for almost a century now. The binding was completely in tact and there was no sign of fading to be seen. 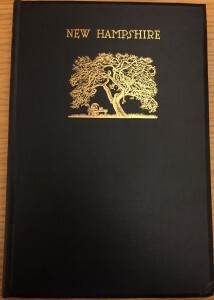 Both the title and the woodcut on the cover are painted in gold, which could be linked to his poem, “Nothing Gold Can Stay.” The unique typeface of the title is only seen in three other sections of this book: in the introduction of the volume, in the introduction of Notes, and in the introduction to Grace Notes. The typeface is complemented by the woodcuts that pop up throughout this book. 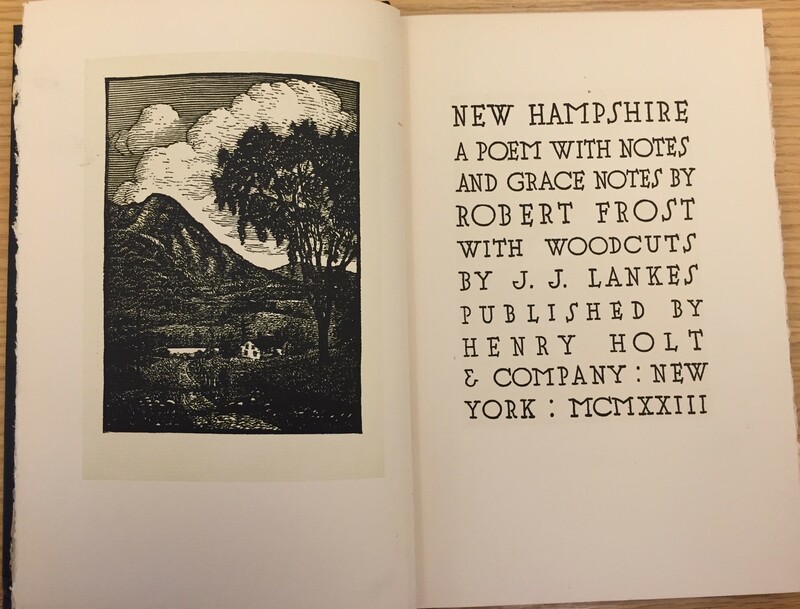 The unified, rustic style of both the typeface and woodcut suggest that Frost may have wanted his poetry to be read in a certain way. Seeing that his poems deal with primarily pastoral topics, it seems appropriate that the typeface appears handwritten and simple, while the woodcuts depict bucolic, natural scenery. In fact, the woodcuts were created by print artist JJ Lankes, a close friend of Frost’s. Lankes also created woodcuts for Frost’s other publications, as well as prints for other authors such as Sherwood Anderson and Beatrix Potter. And dead weeds like a disappointing snake. And there a clump of houses with a church. This edition of New Hampshire personified Frost in many ways, in my opinion. The simplicity of its façade is a testament to the way that Frost wanted his poetry to seem simple on the exterior, yet intricate and tricky beneath the surface. 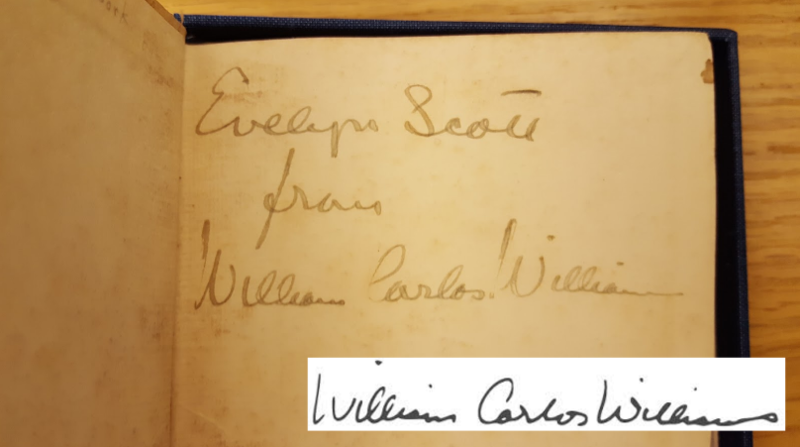 In 1913, Williams Carlos Williams published his second book of poetry, The Tempers, through a small publishing house in London with the help of fellow modern poet, Ezra Pound. Williams was already 30 years old at the time, but this collection was just an early step in his career. 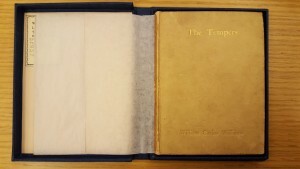 A first edition copy of The Tempers, one of only 1000 printed, is preserved at the Watkinson Library in a small, royal blue box. The artifact is eye-catching not for its grandeur or style, but because it is so small. At around four and a half inches, the entire book fits in the palm of your hand. Something about its miniature-nature marks the book’s uniqueness and makes it even more enticing to encounter. 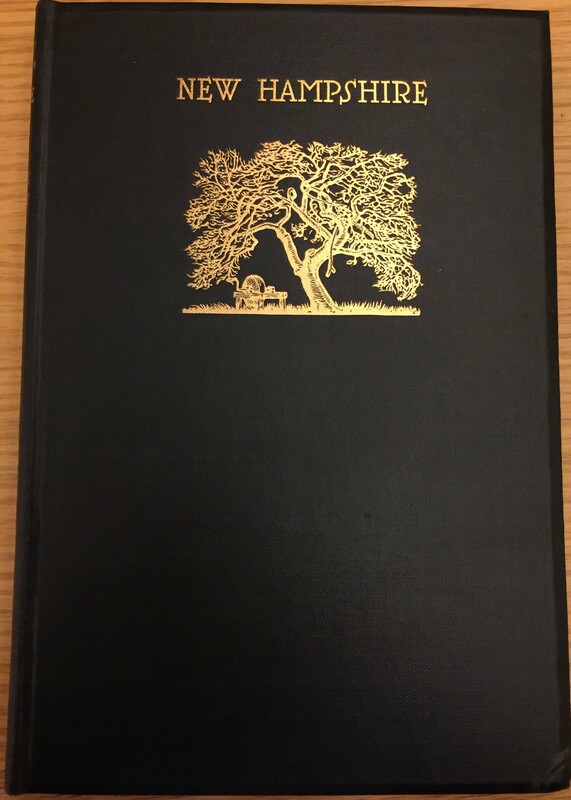 Other than the blue box (which was likely added by the Watkinson to protect the fragile binding), a plain, beige cover and gold inscription of the title are the only decorations. These stylistic choices seem to speak to Williams as a poet. The simplicity of the edition is a reminder of his domestic and pastoral subjects as well as his emphasis on honesty. While the outside of the edition already offers reflection on Williams’ career, the inside pages hold many more opportunities to explore his life and poetry. 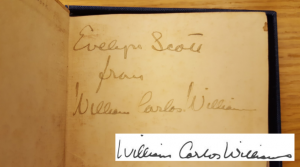 On the very first page, an inscription in loose cursive handwriting and fading, grey ink reads: “To Evelyn Scott from William Carlos Williams.” Discovering Williams’ own signature (here compared side by side to his signature logged at www.poetsquarterly.com) was quite a pleasure. It brought many questions to the imagination, as well as the unique feeling of knowing a celebrated and genius poet held this very book in his own hands. In addition, the signature raises the value of the book immensely. After researching some rare book sellers, it appears that these first edition copies typically sell for around $1000, particularly because few of the original and incredibly fragile copies survived. With the added benefit of Williams’ signature, the selling price of the book goes up to somewhere around $7500. Unfortunately, the condition of the book is relatively poor. The outside edges of the pages where they were folded together during production were not cut open, but forced apart and torn, likely by an eager reader. The handwritten note from Williams raises an important question: who was Evelyn Scott? The answer to this question provides a bit of insight into Williams’ intellectual circle. Evelyn Scott, also known as Elsie Dunn, was an American novelist, playwright, and poet operating in the same period as Williams. At the time, she was an important part of the modernist circle, known for being an experimental writer published in avant-garde magazines. In biographies of Scott, it is always mentioned that William Carlos Williams was one of her many literary friends. Unfortunately, while Williams’ reputation has been cemented as an influential American poet, Scott eventually faded into the background after two decades of literary significance in the 1920s and 30s. The two names contained within this single copy leave much to be explored about the literary circles of the time. It is exciting that this book, a gift from Trinity alum Arthur Miliken, was at one point involved in a personal exchange between two poets. 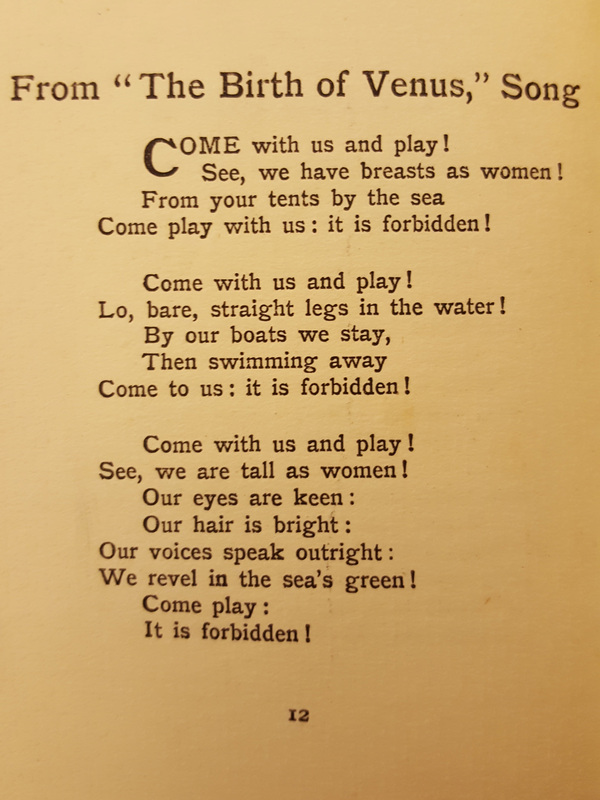 Overall, the biggest surprise when examining this collection by a proudly American poet was that it was published in London. Even more surprising is the fact that no American edition of The Tempers was ever released. This felt quite contradictory to Williams’ agenda as an American nationalist poet. At the same time, it speaks to the fact that the poetry community was still largely focused around London during this period. It likely felt as a necessary starting point, especially under the advice of Ezra Pound, who made his fame in the literary community of London as an American expatriate. Pound was, in fact, the orchestrator of this publication and Elkins Matthew was his main publisher. After meeting at University of Pennsylvania, Pound became a friend to Williams and helped develop his reputation. But later in their careers, the two poets experienced a polar divide. Williams’ style developed in a way that was distinctly American, felt scorned by Pound, and purposefully excluded himself from the elitist, European poetry community. When looking at The Tempers, the trajectory of the relationship between Pound and Williams serves as an interesting backdrop for examining the poetry. Most of the poems in this volume do not sound anything like the Williams of his later, more successful collection, Spring and All. Poems titled “Con Brio” and “Ad Infinitum” feel much more like the type of poetry Pound would support. 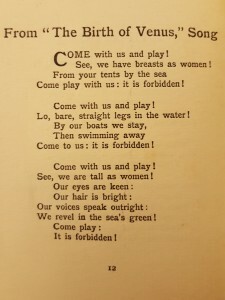 The poem, From “The Birth of Venus,” Song, is pictured here as an example of the poetry in this early collection, which is still cemented in the conventional. 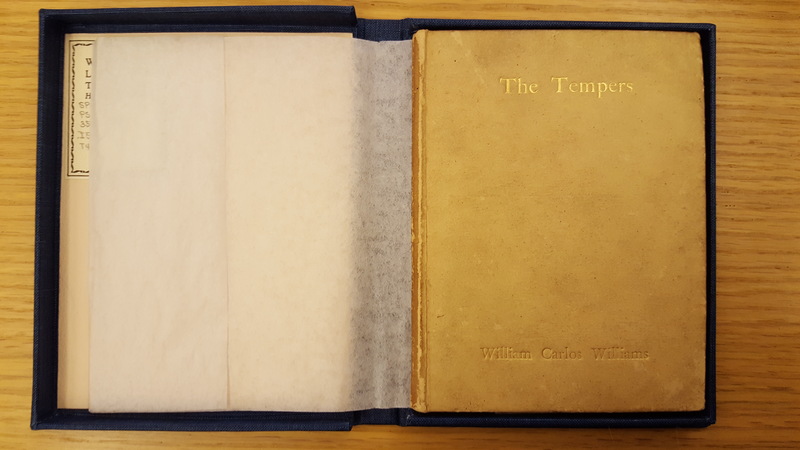 Knowing that Williams’ brand of experimentation eventually developed in a very unique way, The Tempers provides some interesting insight into his early career and is simply a miniature wonder to investigate. T.S. 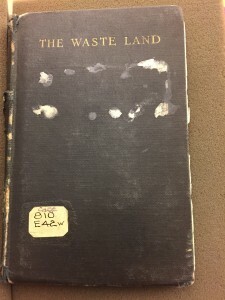 Eliot’s The Waste Land was published as a single book by Boni&Liveright in November, 1922. 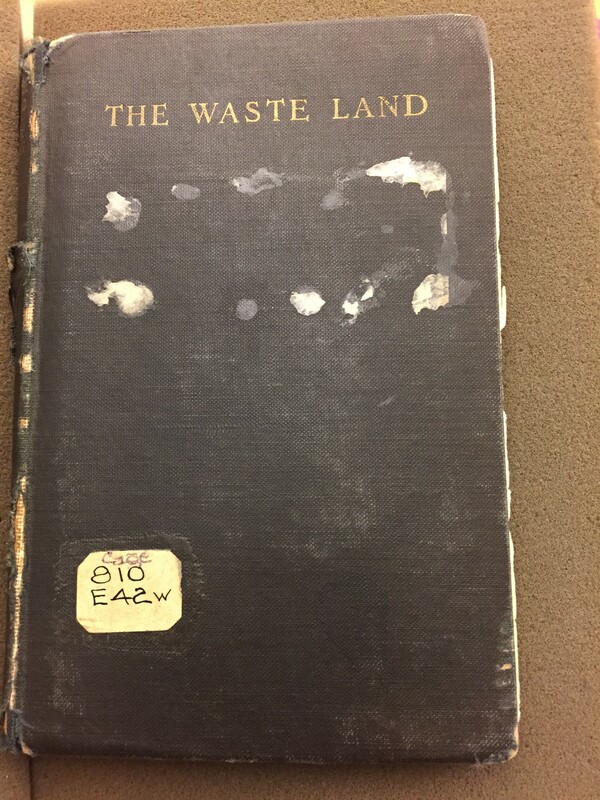 The first edition of The Waste Land comprises of 1000 copies, and one of these can be viewed at Watkinson Library, Trinity College. The book I held in hand is about the size of an A5 notebook and has 64 pages in total. Judging from its appearance, the book probably has been checked out many times by readers over the years. The stiff board binding is lose, and the place for a title sticker is torn off from the black canvas cover (Fig.1). 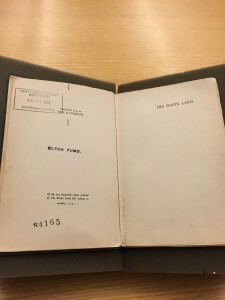 According to the bookplate, the book was initially received by Trinity Library as a special collection with the donation from Elton Fund, which was founded by a Trinity alumni, John, P. Eton, in 1854, and this collection later merged with Watkinson Library after it was built. The worn-outness does not veil the aura the book emits. 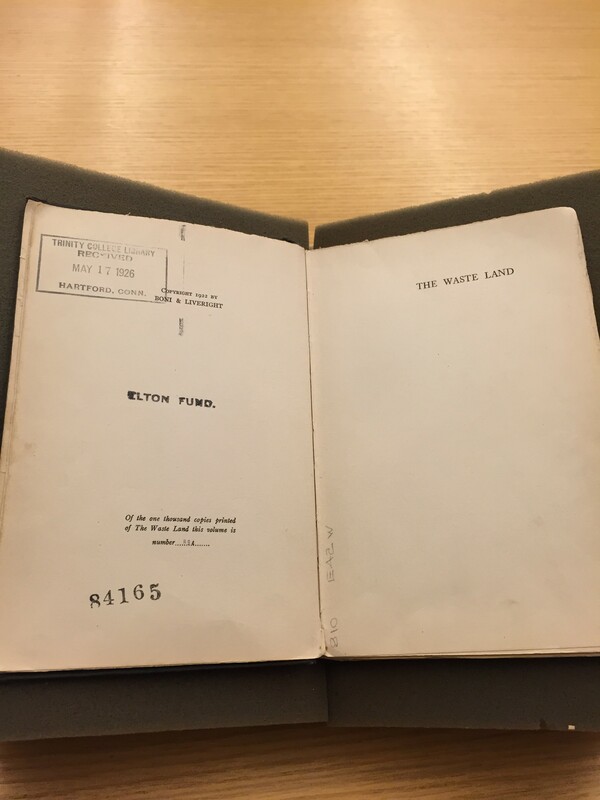 On the limitation page, it writes, in 5mm type front: ““Of the one thousand copies printed /of The Waste Land this volume is /number 894” (Fig.2) Gazing at it seems to throw you into an imagined community –who are the original readers of the first thousand copies? The number 894 becomes enigmatic which seems not only to identity the uniqueness of the book, and offers an imaginary space for its readers. With this design, the editor seems to have in his mind the future collective value of the book. Reading the poem in a book format is slightly different from reading it in Eliot’s Selected Poems. Unlike Selected Poems, one has “Sweeney Among the Nightingales” before it and “The Hollow Men” after the poem, which all might have impacted one’s understanding of The Waste Land. As a single book, the poem becomes its own context and content. Firstly, the epigraph that is printed in the beginning of the poem is moved to the title page. The epigraph is put in the middle of the title page, between the author’s name and the name of the publisher. By making the epigraph a part of the title page, the editor separates it from the rest of the poem and gives a weightier meaning to the title itself. Only after flipping through the limitation page, the second half title page, one finally finds the real poem. In addition, the book invites a participatory experience towards the reading. Interestingly, copious notes are made by several different readers. These note makers attempt to identify the sources of the quotes and at the same time try to unravel what is Eliot’s intention. For example, one find notes marks about the allusion, such as “Philomel” beside “Twit twit twit/Jug jug jug jug jug/So rudely forc’d/Tereu” (30). One also find comment like “humanism?” beside “Oh keep the Dog far hence, that’s friend to men,” (16); One writes “To Hollow man” beside “Do you know nothing? Do you see nothing?/Do you remember/ nothing?” (21); one writes “tempest” beside the sentence “Those are pearls that were his eyes.” One also finds “extreme despair?” beside “What shall we ever do? (22); One marks “extreme despair?” beside “what shall we ever do?” And one marks “form of grief” beside “Treu” (31). For these readers, reading The Waste Land means putting a lot of effort of identifying connections, just as what we were doing in class. Eliot’s presentation is good- Lasting examples! – although- he writes absolutely and many can not gain the entire value – modern man is in a hurry “Hurry up please its times” – can’t take time to analyze all material again greatest fruits. Modern moralists recognize the fault in the 20th cent(ury) human but do not give any corrective measures- Philip Wylie, (An) Essay on Morals, Eliot does! Judging from the tone of the writing, the first note probably comes from the first owner of the book. He is delighted to find the poem resonant with the fast pace of modern life. The second reader responds both to the first reader and the book itself. He cited from a book to argue that the modern writer does give a “corrective measures” to the fault of modern life. 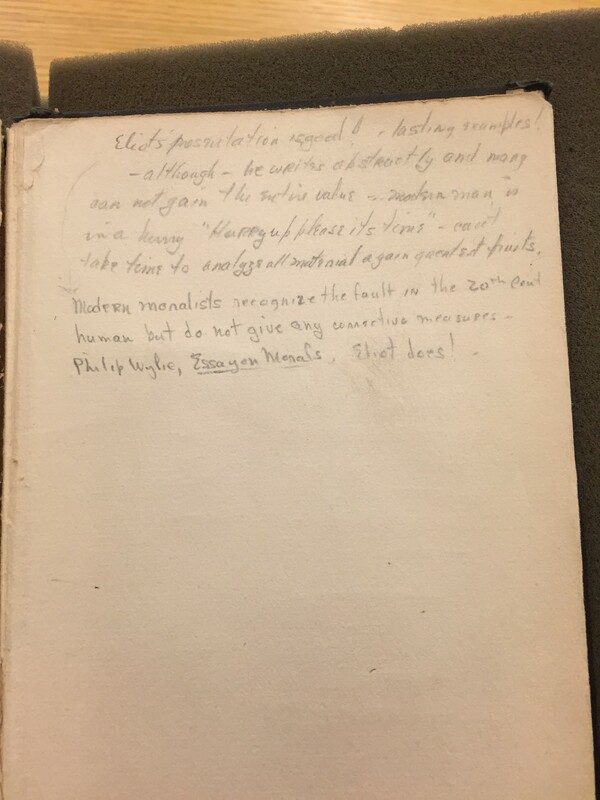 Since this book, Philip Wylie’s An Essay on Moral is published in 1947, the note is definitely made later than that. Over twenty years, the first reader identifies Eliot as a speaking voice for his time and the second reader attempt to read him into a representative moralist figure. Both readers recognize the positive energy Eliot generalizes in a poem seemingly full of despairs. The reverence they give to him seems hard to understand yet the original dust jacket does provide a possible answer. According to the photos of the original dust jacket I retrieved from New York Public Library Digital Resources, these responses correspond with the advertised value of this book. On the front side of the dust jacket, it presents the book title and a text box illustrating this poem as the 1922 Dial award. 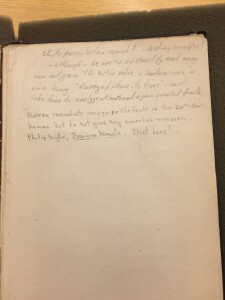 The left flap of the jacket contains an introduction of the poem, which praises it as a synthesis of all of Eliot’s early works, and gives a universal voice to addresses the despair and resignation arising from spiritual and economic consequences of the war. Published three years after WWI, the series number “894” can be identified as any individual in the society who tries to understand his life in the wasteland of the culture. And through this design, one sees in this book how a publisher attempts to preserve an author’s aura in the age of mechanical reproduction. You are currently browsing the I Found It at the Watkinson! blog archives for April, 2016.